What did Jesus say when Thomas asked, "How can we know the way?" Greetings again, Brethren, from headquarters! Here in Mr. Garner Ted Armstrong's office exciting news has been coming in from the church areas - around the world. Once again we would like to share with you - who are all part of the family of God - some of the encouraging and exciting events that are taking place in the Churches of God. Local Church Newspapers. In some of the church areas, the publishing of local church newspaper has sparked a great deal of keen interest and enthusiasm among the brethren. 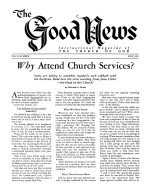 These local church newspapers are jam-packed with articles about church happenings and activities in the local areas. As we receive copies of these church newspapers from around the world, and read the many articles about God's people and the things they're doing, we feel much closer and more a part of the family of God. Those of you who already have a church newspaper under way know what a blessing these local papers are. In a few months, most of the local churches will have their own newspapers - bringing joy and fellowship into the homes of all of Gods people.